Seamless Piecing: Bunnies Don't Lay Eggs! Sorry for the lack of photos in the post. My computer went belly-up last week. The Amazing Mr. Fixer-Man and his Magic Tool Box were able to fix the hardware, but now I've got a software issue that isn't allowing photos to upload. We'll be right as rain next week. At our house we've raised rabbits for pets and profit. And we've had chickens for pets and eggs. We've even had rabbits and chickens at the same time. The rabbit hutch is a mere 3 feet away from the hen house. Often we've let the bunnies and chickens roam freely in the yard...at the same time. While our chickens lay eggs every day... the bunnies, on the other hand, NEVER. LAY. EGGS! Not even for April Fool's day. So... what's the deal with the Easter Bunny? He's a giant rabbit wearing a bow tie but no pants, handing out candy to small children. Easter is in just a few weeks. It's been a tradition in our family to celebrate with the fun traditions on Saturday so we can focus on more reverent things on Sunday. We like to color boiled eggs with crayons and dye. We fill the plastic kind with candy or coins. Then, weather permitting, we hide all the eggs outside and turn the young'uns out to find them. Sometimes the young'uns hide the eggs and the olders go find them. Four of our grand babes are old enough to understand games now (ages 9, 5, 3, 2 1/2) so we're upping our game this year and making the Saturday event about more than just the guy with the bow tie and no pants. We'll start by coloring eggs. 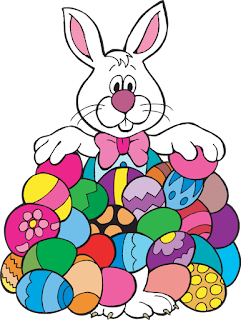 You can have an Easter Egg hunt without the Pooka but not without eggs. And nothing says Easter like food color stains on your hands and clothes. *Note to self: remind moms to bring aprons. While the designated egg-hiders are doing their job, the rest of us will play some games. We'll plan on playing outside, but we'll be prepared to move it inside if the weather doesn't cooperate. When ours kids were little, we'd flip over a chair and toss wide mouth canning jar rings over the legs. An oldie, but goodie, we're bringing that one back. We'll take the Lil Tikes hoop outside and assign a kid to each dad (we have equal numbers). I don't know what the rules will be yet, but only kids will be allowed to score, and only if they have both feet off the ground. It's a work in progress. When we were kids, our aunt sent us a bean bag toss background she'd painted with a clown. (That was back in the day when dinosaurs were scary and clowns weren't.) We played with it often. Mr Clown used to be red and blue but the paint had worn down the bare wood. Now repainted, it's back in my possession and it will be introduced to my grand babes for Easter this year. A picture is worth a thousand words, so a video should fix us right up! As I was dealing with scraps last week I found some cute baseball fabric left over from a quilt I made for my oldest son. He loves baseball. His initials are MLB so it only makes sense. My first question was, "What do you fill a bean bag with?" That was a "face Palm" moment.... Beans!... Duh! Bean bags are easy to make. Just sew around the squares, or circles, right sides together, leaving an opening for adding beans. I went around a second time with a zig zag for strength. Using a funnel, ( make one out of paper if you need to ) fill each bag about 2/3 full of beans. 6 small bags took about 2 pounds of dry pinto beans. Tuck the open seam allowance into the bag and pin. Use another pin or two to pin a barrier that will keep the beans in the bottom of the bag while you sew the seam shut. Remember these are just bean bags, so they don't have to be pefect. The next questions was, "How big should a bean bag be for a 3 -5 year old?" I first thought 5" sounded good. But a 5" pouch can hold a lot of beans. I wondered if it would be awkward for a 3 year old to toss. In the end I went with 4"- ish, and I didn't fill them all the way. I made some round ones too. They turned out awkward looking and didn't feel that much different in my hand. If you make round ones, use a circle template so they don't end up like mine. I'd have gone with cute Easter fabric but I figured the baseball motif fabric would not show dirt as much. As always, use what you have. The hiders-of-eggs should be ready for hunters by the time we've gone through the games. We'll have the egg hunt and I'm sure chaos will reign as it always does. Maybe we'll do something to slow the flow, like tie a grown-up to each kid. When all the eggs are gathered, we'll let the kids cash in the decorated boiled eggs and get lunch happening. We'll send the kids and dad's back outside for another round of games while the moms magically turn the eggs into sandwiches. (some of the moms have already put limits on the number of eggs the dads are allowed to eat.) We'll have something to go along with the sandwiches to keep the methane production to a minimum. When tummies are full of mostly jelly beans and a little protein, we'll gather everyone together for making Resurrection Cookies along with telling the Easter story. If you've never made Resurrection or Empty Tomb cookies, give it a try! They "bake" overnight in an preheated, but OFF oven so plan ahead. Easter is about the Lamb, not the Bunny. In your prayers today and always, don't forget to thank God for the gift of His perfect Son who made resurrection available to each of us, and all of us. By the way... that includes YOU, and me. Don't forget to Follow by clicking the Followers button in the right sidebar. And follow on Facebook and Pinterest. Have you made Resurrection Cookies? Was it this recipe? How did it go for you? What are your Easter traditions? Tell us about them in the comments section below. I know it's early for the Happy Easter wish, but I wish you joy as you prepare yourself and your family and friends to celebrate this most important event of all. See you next week when we begin sewing the Part and Parcel Mystery Quilt.